The Palm-Wine Drinkard was written in the first person narrative. The protagonist tells the story of how he was so addicted to palm-wine that his father provided him with the best palm wine tapper in the world. Unfortunately, the latter passed away. In consequence, the palm wine drinkard was determined to find the deceased, bring him back and ask him to continue with his job as his "personal palm wine tapper". Hence, began an arduous journey to the land of the dead, which triggered amazing chain of events. Starting with his encounter with curious creatures, the red people in the red town, the wraith-island and the white tree destination. The unreturnable heaven's town. How a full bodied gentleman was reduced to a head and the invisible pawn and etcetera. It goes without saying that The Palm-Wine Drinkard is a folkloric magical and mystical novel. Magic is performed and supernatural beings and ghosts naturally interact with human beings. Indeed, a surrealistic read. In my opinion, The Palm-Wine Drinkard is somewhat a difficult novel to review considering the fact that it is unlike anything I have ever read before. Although, it is comparable to the stories my grand-mother used to tell me in my infancy. For example: the story of a beautiful woman that refused to get married to any man and ended up married to a skull that hops. The story of someone that visited the land of the dead for one reason or the other. And, the story of why the earth and the sky were separated from each another and so on and so forth. In fact, they are those stories I was always looking forward to after dinner and there is blackout. Even though, this book might have not been written in a Standard English, it is no deterrent to understand and therefore enjoy the story. As a matter of fact I took delight in reading it. 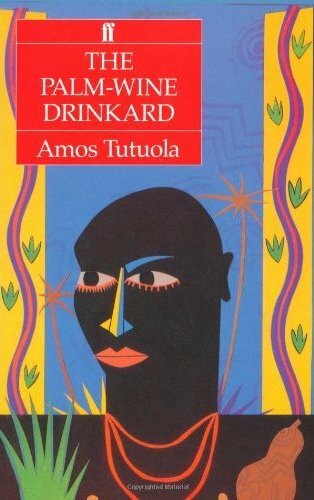 The Palm-Wine Drinkard was written in the 1940s and published in 1952; thus, the oldest published novel in the African Literature I have read so far. The kind I would love to read and then reproduce orally. Undoubtedly, there is not one style of African literature. For this reason, I find it ludicrous when some are efforlessly trying to pigeonhole the African writers, who are certainly in their full right to expound on whatever topic they deem fit. These people are ignorant and need to be enlightened. Probably, they should start with reading the Palm-Wine Drinkard. I am looking forward to reading more of Tutuola's novels or folk tales. Yes, I highly recommend; however, please bear in mind that you would be embarking on a surrealistic read. That definitely sounds like an interesting format. I wonder whether I would like it or not. Books with magical/mystical elements without being full-blown fantasy often don't work well for me. yes, it is quite interesting. I must tell you it is full-blown fantasy. The only thing is that, it is not written in standard English, that might be the only reason why it might not work for you. Because, if it is just for the fantasy, believe me it is full blown. I've been looking for this book for a while now. It's on a list I'm supposed to be reading. Funny @ It's on a list I'm supposed to be reading. It's a pretty old book could be difficult to find, although mine is brand new. Finally, I've read this novel. Great review..... I have had this book on my to-read list for a while now, ever since I read that it was the first Nigerian novel. Does it have a version for kindle? It is an interesting folkloristtic novel. You would enjoy it, despite it's non-standard English structure. A kindle version?? not sure. I believe not yet, but very soon though. Lucky you, you have a copy of that novel. I am so very much looking forward to reading it. They are folk tales. I am sure you would enjoy it. Don't pass up the opportunity. what a nice blog you've got. Nice review there Mary. I've read this book and I must say, it actually contains a lot of the stories I was told when I was a kid. I'm looking forward to reading his other books. Thanks for stopping by, I am as well looking forward to reading his other books. This was an enjoyable experience. would love to, unfortunately all I have to offer is my published review on my blog. I'm really curious to read this book. I like the concept of it. I really appreciate art pieces that more fascinating than dark magic. Based on how you've described I can foresee a lot humour in the piece. Good job Mary! You do a great job in capturing the essence of the book in particular and how it relates to African culture/literature as a whole. Thanks Wandoo for stopping by. Yeah.. you should read it you will not regret it. An artistry of magical realism, a representation of African colonialism in mystic mythical ideology, with great thematic preoccupation of modern African existence ingrained beneath its 'broken' expression in English...good job Mary, love your blog...keep it up. The palmwine Drinkard a simple yet fasinating piece.... a must read!!! I agree, it is a must read. I really will appreciate if someone can help me with the pdf version of it or any site to which I can download it.